First off thank you to everyone who attended my session at code camp. I hope you learned something new! I’d love to get feedback on how you felt the presentation went. Please leave me some comments here or shoot me an email or whatever. In this session I used an app codenamed LionHeart to help explain the concepts and framework I presented. To learn more about the framework I have a blog series named Simplifying the Windows Phone Development Experience! Codename: LionHeart. In this series I go in much more depth about the same concepts I presented on. Please note the source code release does not have fully completed app however, the framework used in the app is stable and the API’s are almost locked down. When the framework is complete it will be available in Project Template form. This will allow you to easily start a new Windows Phone project with all of the boring boiler plate work completed for you. My last post in this series covered the CoreApplicationService (CAS) and how it handles app lifecycle which is part of a broad series discussing how to simplify Windows Phone development. In the lifecycle post navigation was discussed only lightly. This post aims to cover the CAS and how it handles navigation. It will also, cover a few open questions about lifecycle from my previous post. The CAS was originally created and used for navigation exclusively. Desires for centralized lifecycle, tombstoning, and navigation management drove us to buff out the former NavigationService and rename it as CoreApplicationService. Since the NavigationService, we have optimized, simplified, and fundamentally improved navigation on Windows Phone applications. The most important of lessons that we learned was to make sure data is centralized in the app. Any object reference that needs to be passed to the next page can only do so if the reference to that object is available from a centralized data provider. We won’t cover data providers here, but I wanted to bring this lesson to the forefront in order to help bring clarity to the thought process behind the navigation paradigm used in the CAS. We had unknowingly painted ourselves into a corner during our development one of the phone apps we developed. We desired to modify the same object reference in two related pages. We made the mistake of storing the object in the PhoneApplicationService.Current.State dictionary. What we didn’t realized until the final weeks of development and testing was that State dictionary serializes the objects stored in it. That means when obtaining an object stored in the State dictionary it was being deserialized as a new object. We would then modify that object and return back to the first page. The first page would then assume the object was updated when in reality a different object reference had been used and updated. This was a huge bummer to realize so late and taught us to never pass objects via the State dictionary if we need the original object reference. With that said lets get into some navigation topics. Those familiar with Windows Phone development know that in order to perform any kind of navigation you must use the PhoneApplicationFrame. When initializing the CAS in App.xaml we pass in the PhoneApplicationFrame. This gives us the ability to navigate without requiring a PhoneApplicationPage which is the built in intermediary to the PhoneApplicationFrame. The navigation framework in the CAS is essentially a more developer friendly API wrapper for the PhoneApplicationFrame navigation framework. Our goal was to expose all of the PhoneApplicationFrame navigation framework while buffing out the points where it was lacking. This is one are of functionality where we’re trying to optimize still. Currently we have a dictionary of object to string mappings. The string represents the Uri to a page while the object is some arbitrary key that maps to that page. Managing the keys is the difficult part that we haven’t quite figured out yet. Here is how we register the mappings in LionHeart. By using this dictionary of mappings we gain a huge amount of flexibility. This allows the developer to expose and manage navigation keys in lower tiers of the app if desired. In the sample code we use a struct named ViewKeys to manage or contain all view keys. We’ve tried using object types as the key, but we always seemed to come to a point where we were mixing types into ViewModels that shouldn’t know about certain types and tightly coupling types to views. That doesn’t sound all bad, but from experience a struct of string keys has been one of the cleanest and readable approaches. Note on Managing Views and ViewModels in the CAS: The PhoneApplicationFrame has a BackStack property that manages all pages that are alive in the app. We didn’t want to manage Views or ViewModels in the CAS because that work was already being done by the PhoneApplicationFrame. We also didn’t want to tightly couple the CAS the UI tier, in fact that’s exactly why we need the CAS is that the PhoneApplicationFrame is only available in the UI tier unless passed into a different tier. The CAS is immediately available to ViewModels and any other tier above the very base tier. Not very exciting… And moving on. Now we get into the exciting stuff. How we perform a navigation. Here is some code from LionHeart in HomeVM and helper class NavigationDefinition to help illustrate how to do this. This simple helper class is just a wrapper for the desired ViewKey, a dictionary of parameter keys and values, and a display friendly name. This class helps to with creating a menu of navigation options in the UI such as the one created in HomeVM.InitializeMenu() in the sample code above. When we navigate we can append parameters to the page Uri when we pass it to the PhoneApplicationFrame. In HomeVM.InitializeMenu() we create parameters for each NavigationDefinition with a key of ViewKeys.MY_VIEW_KEY. In this case the parameters will be used to determine which pivot item is in view when the user navigates to MyView. How this is done will be covered in a future post. In HomeView there is a ListBox which displays each NavigationDefinition. The selection of the ListBox is bound to HomeVM.NavigationTarget. When the user selects a definition and NavigationTarget is set we call Navigate() from it’s setter. Navigate() in turn calls CoreApplicationService.Navigate() passing it the view key and the dictionary of parameters. /// Navigates the specified viewKey. Here we find the meat of navigation processing. The first thing done here is a check to validate the viewKey is a valid key to a page Uri then acquires the target page Uri. If no parameters were passed an empty parameters dictionary is created and immediately we add a parameter for IS_RUNNING_KEY which is always set to true if this method is called. The IS_RUNNING_KEY key is used by ViewModels in order to know how to initialize. Again, another topic that will be covered in a future blog post. After the parameters collection is finalized the CAS then appends each parameter to the target Uri forming the finalized target Uri. The next step is to hook up handlers for the PhoneApplicationFrame.Navigated event when necessary. Sometimes it is desirable to perform a navigation that clears the entire PhoneApplicationFrame.BackStack. Other times, it is desirable to remove a specified number of pages from the PhoneApplicationFrame.BackStack. If clearBackStack is true then after navigation is complete the CAS clears the PhoneApplicationFrame.BackStack. If clearBackStack is false and countToRemoveFromBackStackAfterNavigation is greater than 0 then after navigation completes the CAS removes the specified number of page entries from the PhoneApplicationFrame.BackStack. This functionality is helpful for navigating to menu pages and in app navigation resets. Finally, the CAS calls PhoneApplicationFrame.Navigate() allowing Windows Phone to take over. First, there is currently a disconnect in terminology. Windows Phone calls each View a Page, and here at Interknowlogy we’re in the habit of calling each Page a View. So each term means exactly the same thing and we’re working on simplifying our terminology. With that aside lets look at ViewBase. ViewBase becomes the new base class of each View in the app. This cuts down on duplicating this code for each view. Because of that maintainability goes up, which is always a good thing. ViewBase is by no means required, but it is a nice piece of reusable code. Each page desiring to leverage the navigation framework must have a ViewModel derived from PageViewModel as its DataContext. ViewBase is responsible for knowing what to do with its ViewModel and when to do it. It knows that in OnNavigatedTo the ViewModel needs to be Initialized with the specified parameters, and that in OnNavigatedFrom and OnRemovedFromJournal the ViewModel needs to be Uninitialized and how. OnRemovedFromJournal is called on a Page when it is removed from the PhoneApplicationFrame.BackStack. The CAS makes navigation more powerful and flexible. It’s simple to request navigation via the CAS and it’s reliable. The CAS does not replace existing navigation options, instead it builds upon the existing framework and extends possibilities. The CAS also makes navigation more reusable and readable inside ViewModels. I hope this post helps inspire innovation with Windows Phone. In my post Simplyfying the Windows Phone Development Experience! Codename: LionHeart I explain that LionHeart is a demo app that I’m using to prove out a few lessons we’ve learned here at IK from our last Windows Phone project. In this post I will start to get into the meat of the app starting in a class named CoreApplicationService (CAS). In all cases, the CAS acts as a forwarding system for any object the desires to subscribe to these events. In LionHeart those objects are usually VMs. This pattern allows the VM to be responsible for knowing when and what to do during these events. This pattern has made more and more sense as we’ve discussed possible solutions to our problem of telling VMs when to Deactivate (prepare for tombstoning) etc. Another responsibility of CAS is to prompt the consumer of the app to send error data to the developer. We found Little Watson created by Andy Pennell at Microsoft which simply collects unhandled exception information and stores it in a file in IsolatedStorage before the app closes. The next time the consumer launches the app they are prompted to send the error file to the developer, which they can choose to not send it if they desire. The error file is then deleted and the application will not prompt again until an error file exists again. This is so helpful I cannot even begin to express how many bugs we have been able to track down because of this tool. I want to start buffing this helper class out with logging since the error information we receive on the phone is not as helpful as it could be. Adding a logging feature that began each time the application was launched would be of even greater benefit. In the example code above you will notice the use of ViewKeys which is a struct that contains string values that we use as keys. The key does not need to be a string instead it can be any object. Sometimes we will use typeof(object) for views that represent specific types. We found that strings were required for some views and decided to go with all strings for consistency. Remembering that VMs will be requesting navigation most of the time we did not use typeof(Page) as the key, because VMs should not have access to those types. The CAS is provided via a static property of itself named Instance as a singleton. There are two times the CAS will need to be instantiated. The first is when the application is Launching. The second case is when the application is being Activated, but only if there is no application state. In both cases no VMs exist yet, therefore the CAS will not forward the Launching and Activating events because no object would or could receive them. Instead we use the events to initialize the CAS. InitializeNavigationMappings(); //As shown in above section “What is CoreApplicationService’s Purpose?” and subsection “Navigation”. Initialize accepts two parameters: the PhoneApplicationFrame which is used for navigation, and a boolean indicating if the application is launching. The reason for the boolean is for VM initialization. This will be explained in much greater detail later on, but for those curious minds out there during Activating (without state) when VMs initialize there are no navigation parameters. This is used as an indication that the application was tombstoned. Because this same state exists during Launching we must differentiate the two somehow. We got around this by adding a boolean to the tombstoning values that is checked for when no navigation parameters exist and indicates the application is Launching not Activating. As I stated before I will cover this in later posts in greater detail. This concludes the introduction into the CoreApplicationService and how it plays into the lifecycle of the phone app. This service is the backbone to LionHeart and all phone apps that use it. As we cover navigation and how VMs integrate with this service you’ll understand why it is so important and why it is so helpful. As always if you have any suggestions for improvement, comments, or questions please post them. 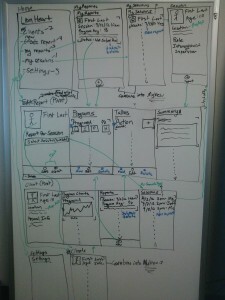 This is not meant to be a one man show, but rather a starting point for phone app architecture.